What is a Dohne ? The Dohne is a dual-purpose breed developed by the South African Department of Agriculture using Peppin-type ewes and German Mutton Merino sires. The progeny were interbred and selected for high fertility, rapid lamb growth and fine wool under commercial pastoral conditions. The breeding program was initiated in 1939 and the breed society formed in 1966.Selection since 1970 has been done with the aid of performance and progeny testing. In general appearance the Dohne is a naturally polled and plain-bodied sheep that produces fine-medium wool. 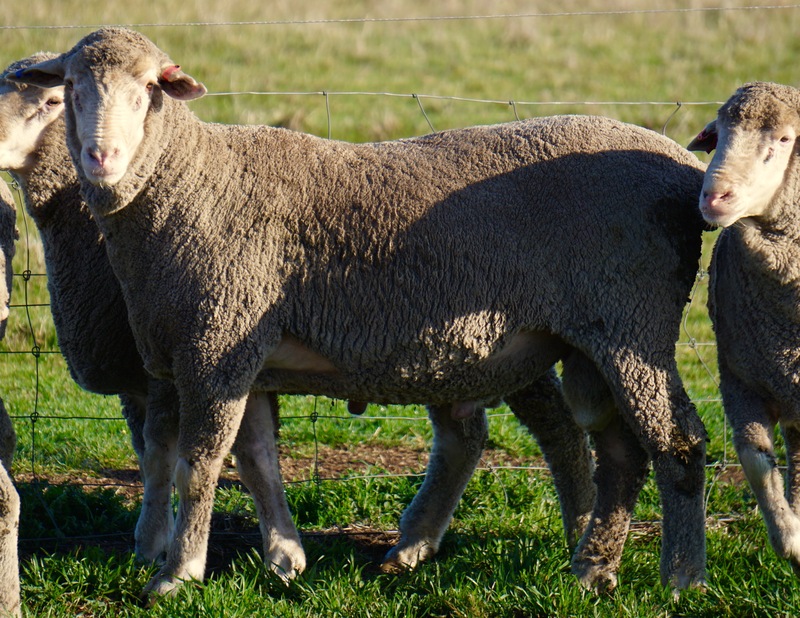 The Dohne is a highly productive dual-purpose sheep, bred to combine prime slaughter lamb production and fine, white wool in a self-replacing, fertile, hardy and easy care commercial flock. High fertility (110-150%) is combined with rapid lamb growth rate (370 gm/day) up to weaning making the Dohne a highly efficient meat producer. 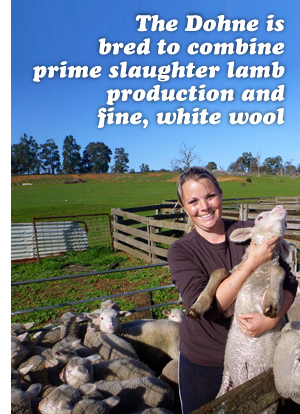 Slaughter lambs achieve a marketing weight of at least 50kg at 4-6 months of age. Mature body weight of ewes varies from 70 to 90 kg depending on environment. Mature ewes produce 5 to 6kg of high quality white wool of 18 to 20 micron. The Dohne is adapted to a wide range of environmental and climatic conditions from intensive production to extensive arid rangeland. The Dohne has a wide dietary range and is an excellent converter of feed. The Dohne ewe is fast becoming recognised as Australia's Premier Maternal Breed, Her fertility, milking ability and an inbuilt calculator. Yes dohne ewes can add up and the survival of multiple births can be counted on.